Editor’s note: The Mariner’ss Museum, located in Newport News, Virginia has graciously allowed the Mariners Weather Log to highlight their current exhibit, “Exploration through the Ages.” In keeping with this theme, this issue features the second of a three part series “Tools of Navigation.” Here we follow the time line of navigational tools from ancient times into the 19th century. The Lead Line, a device for measuring the depth of the water as well as obtaining a sample of the ocean floor, is one of the oldest of all navigating tools. The word “lead” is pronounced the same way as in “lead pencil”. It began with the oldest known boat trading peoples, the Egyptians. We have images of their river trading craft going back to about 3400 BCE. Then, as now, it was inconvenient to run aground….it could ruin your entire day just as quickly as a collision. The earliest device to measure depth was a stick. At first it was unmarked with any depth scales. In time, it would have been. As trading expanded beyond the rivers of Egypt and onto the coast and into the Mediterranean Sea, a stick was no longer adequate. A rock could be tied to the end of a line and dropped over the side. The depth of the water could be measured as you retrieved the line and stretched the line between your arms. By the Fifth Century, BCE, the Greeks were using a lead line which is mentioned by the Greek historian Herodotus. By 1600 in England, the lead line was being marked at certain depths to make the reading easier: 2, 3, 5, 7, 10, 15, 20, and 25 fathoms. A fathom, from the Old Norse word, fathmr, for “outstretched arms” was standardized at six-feet: an average distance between a man’s outstretched arms as he held the lead line. 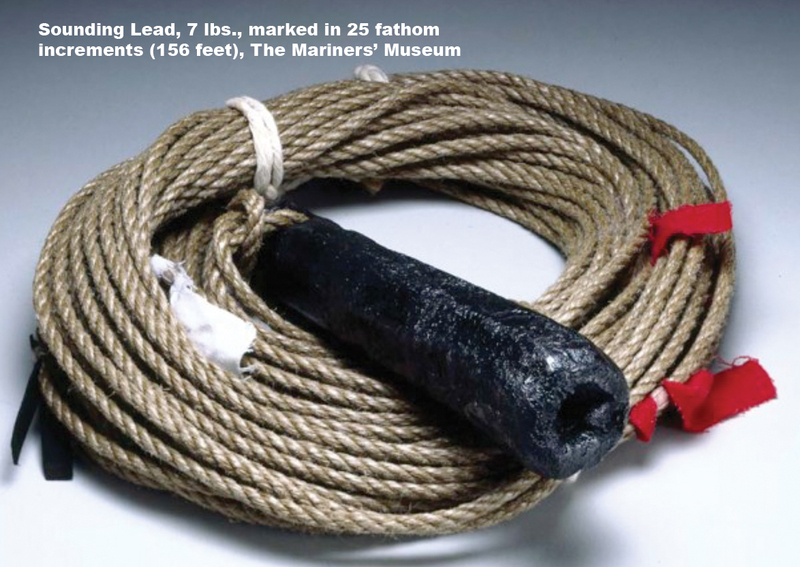 The standard lead line was 20 fathoms long--120 feet-- and the lead weight 7 pounds. That number may seem curious now, but in England of the 1600’s, weights were routinely measured in a 14 pound increment called a “stone”. A half stone, or a “clove” was seven pounds. 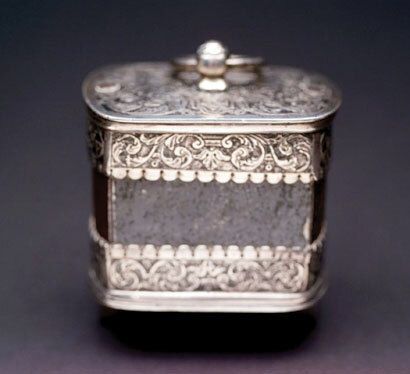 The lead itself was cylinder-like, but slightly fatter at the bottom than the top and a loop was cast into the metal so that a line could be attached. Besides the depth, the lead could also tell the mariner about the type of ocean bottom he was sailing over. The bottom of the lead weight was hollowed out so that a glob of tallow, or animal fat, could be inserted. A glob is a nonscientific, but highly descriptive term for tallow about the size of a golf ball. Since Golf hadn’t been invented yet, the “glob” would do. When the fat glob hit the bottom, some of the material stuck into the fat. Just as on land the surface varies from rock, to sand, to dirt, to pebbles, so too does the ocean bottom. Knowing the material on the bottom along with the depth was an additional means to determine where you were on the featureless ocean as the bottom changes drastically as you travel. As the leadsman retrieved the line, he’d call out the depth. If it were exactly as measured on the line at 2, 3, 5, 7, etc. fathoms, he called out a “mark”: “By the mark seven”. If he estimated it to be one-quarter less, he’d say “A quarter less seven”. If it were more,“ and a quarter seven”, or “and a half seven”. If he estimated a reading in whole fathoms, but not marked, he called it a “deep”; “by the deep four”. Estimates were only made in quarter, half fathoms and whole fathoms. The Phoenicians were masters of sea travel covering great distances in their ships of trade and war. They were the first people to venture to the western Mediterranean and beyond the Straits of Gibraltar to the Atlantic coasts of Africa and Europe. To accomplish these feats of seamanship, they had two systems of navigation. The first was coastal navigation. They used this in short-haul voyages while trading between villages and towns along the coast, and was done while keeping the coast within sight. This was typically a daytime voyage between ports that were no more than 25 to 30 nautical miles apart, and when there were no problems with visibility or direction. The second type of navigation was deep-sea navigation. This was used when the Phoenicians were sailing over open water to destinations that were very far from the port of departure. While they would also keep land in sight, they were much farther out in open water. When possible they liked to anchor safely for the night, but when unable to, they would maintain the right direction by observing the Ursa Minor constellation, called by ancient writers the “Phoenician Star” and now known as Polaris or the North Star. Most nights and during bad weather they chose to bring their ships in to protected areas along the coast. Commercial navigation on the Mediterranean took place almost totally between March and October when weather condition were best. Time keeping on a ship has some special problems: the great variation of temperature on a ship at sea, the motion, and the humidity can all affect the accuracy of the time keeper. At first, sailors could track time just by estimating the position of the sun. From sunrise to noon was about six hours, and another six hours from noon to sunset. There were actually several times during the year when the day was 12 hours long and this system worked fine. But most days are either longer or shorter. Of course, for several thousands of years, no one cared that much about the exact time and this estimating was acceptable. The sand-glass or hour-glass was developed about 800-900 AD and allowed for a reasonably accurate measure of the passage of time. When modern sailors tried to “keep” time they found the sand-glass met their needs quite well. They used at least two or three variations. To keep track of their speed they used a device called a “Chip Log” which required a sand-glass of 30 seconds duration. To keep track of how long they worked, they used a sand-glass of 30 minutes duration. Now the duty time aboard ship, called a watch, is traditionally four hours, and this can be traced back to Egyptian times thousands of years ago, so you might expect a sand-glass lasting four hours. But this would be too heavy and the sand in it more likely to clog. Instead, sailors used a sand-glass of 30 minutes length. By the way, the content of the “sand” glass usually was not sand, but a mixture of ground-up sea shells, stone, egg shells, marble or other materials which would be less like to stick together than sand. A “glass” of an hour’s duration might also be found aboard ship. To make sure the ship’s boy was paying attention, for it was usually his job to turn the sand-glass every 30 minutes, and to let everyone know the time, each time the glass was turned, the ship’s boy would ring the ship’s bell. It would be rung once for each half hour of a four hour watch. So after the second hour, four bells would be rung; after the third hour, six bells. To enable people’s ears to distinguish how many bells there were, they were rung in pairs, two rings at a time. When eight bells were rung, four hours had passed and the next watch hearing the eight bells would come up to relieve the crew currently working. The count would begin again with one bell being rung after half an hour into the new watch, and so on till eight bells would be rung again. With 24 hours in the day, there were six watch. Noon was a significant event to the sailor right up until modern times and electronic navigation. Before electronic navigation, the sailor was able to find his position on the voyage by measuring the altitude of the sun above the horizon at noon. This was so important, that, at sea, the day began at noon, not at midnight. In the morning it might be Thursday, but at noon, it became Friday. This was true right up through 1924. Accurate time keeping was highly desirable, especially for navigating across the ocean, but it was not possible until the invention of a very accurate watch in 1759 by John Harrison of England. While it was accurate, it was also expensive and could cost as much as an entire year’s salary for the captain of a ship. As more people produced these accurate clocks, called “Chronometers”, the price came down. Today, a $10 electric watch is as accurate as the older chronometer of the late 1700’s. costing over 1,000 times as much. The Cross-Staff, in one very early version, goes back as early as 400 BCE. That’s a very long time ago. The Chaldeans in the Mid-East used it, but sailors did not use it until the early 1500s; the first recorded date was 1514. 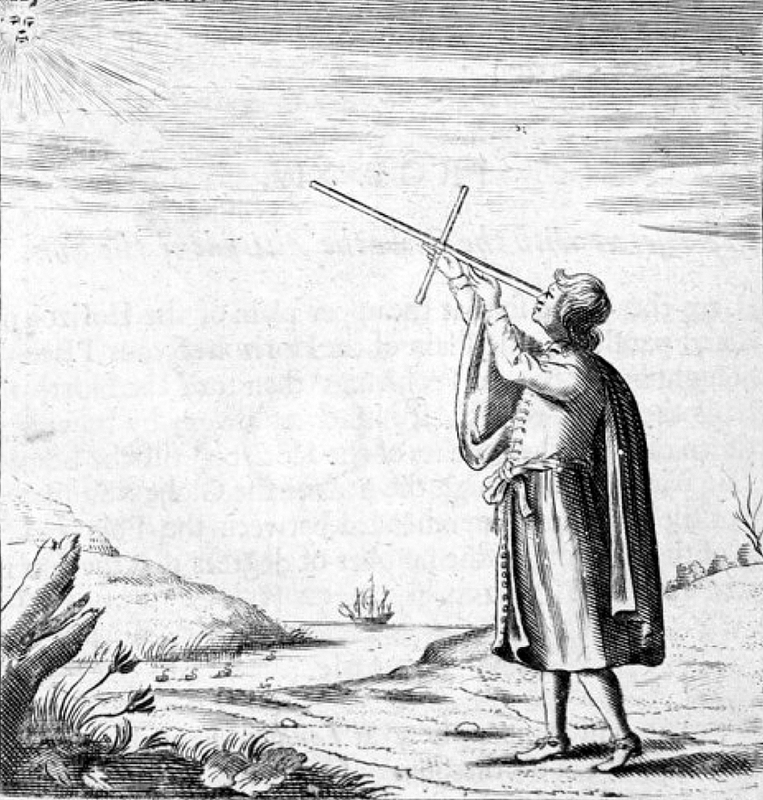 As with other early navigation instruments, the first use for the Cross-Staff was in astrology, in measuring the altitude of stars to help forecast the future. Sailors only became interested in it as a navigational tool when their voyages took them to places unfamiliar to them, such as Africa, India and the New World. The first European to learn of a device similar to the Cross-Staff, the Ka-Mal, was Vasco da Gama, who learned of the Ka-Mal from the Arabs when he visited India in 1498. The Cross-Staff, as used by sailors, was developed from the Ka-Mal. The observer of the sun or Polaris would place the end of the long part of the Cross-Staff below his eye and observe the sun/Polaris across the upper part of the cross-bar while also observing the horizon at the bottom of the cross-bar. This can be done by moving the crossbar closer or farther from the observer’s eye along the long central bar. The crossbar was called the transom and the long central part was the staff. When both the heavenly body (the sun or Polaris) and the horizon were lined up with the transom, the observer could read the angular altitude (degrees) on a scale on the staff. This angular altitude could then be mathematically converted to the latitude of the observer. The transom (cross-bar) came in different lengths depending on the altitude of the body to be measured. The smallest transom was for altitudes of about 15 °, the next size was for altitudes of about 30° and the last size for altitudes of about 60°. The best range for the use of the Cross-Staff was for bodies between 20 ° and 60 °. Smaller and larger angles could be read, but they were not as accurate. The staff (long part of the instrument) had a different scale for each transom marked on the staff. Therefore, there were usually three scales inscribed on the staff. When a person was holding the Cross-Staff, it looked like that person was shooting a bow and arrow; the transom looked like the bow and the staff like an arrow. 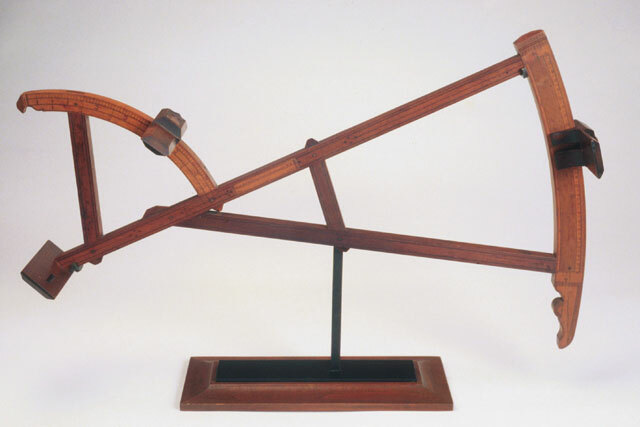 This gave rise to the term “shooting the sun” whenever someone measured the angle of the sun above the horizon, even when the instrument did not look like a Cross-Staff. One of the oldest of all the altitude measuring devices, the Astrolabe is an angle-measuring tool that’s name comes from the Greek, “to take a star.” It was possibly invented by the Greek astronomer and mathematician, Hipparchus (190-120 BCE). However, in its earliest uses, it was for astronomy and astrology. Only when the need to measure angular heights of Polaris became important did we see these instruments adopted for sea-going use. As an astronomer’s tool, the Astrolabe was introduced to the Europeans by Arab astronomers in the 10th century, CE. But the first documented use of it used at sea is in 1481 on a voyage down the African coast by Portuguese explorers. It is likely, though, that it was in use by sailors for many years before that. So how does it work? To correctly measure the angle of the sun or a star, the Astrolabe must hang down so that it is perpendicular to the ocean. If it’s tilted right or left, or front to back, the angle will not be accurate. To keep it straight, the user holds it with a finger through a ring and lets the Astrolabe dangle. Next, take a look at the diagram and see that there are two plates on a rotating arm. They each have a pinhole perfectly lined up so that when the sun shines through the top one, and hits the second pinhole, the angle is accurate. You then read from the scale along the circumference. For Polaris, you can sight over the edge of the two plates. One advantage of the Astrolabe is that you do not need a clear horizon to use the instrument; you do need a clear horizon when measuring the height of the sun or Polaris with other navigational instruments. It is not a particularly accurate tool at sea because of the difficulty in keeping it steady in a rolling ship and high winds. Usually, however, the Portuguese explorers would take their Astrolabe ashore and set it up to avoid this problem; this is what they did when they were mapping the coast of Africa in their early exploration. Using it at sea could result in errors as much as five degrees, or 300 miles. However, ashore, it would be much more accurate, certainly less than one-half degree, or 30 miles. The seagoing version might be 6” in diameter, whereas the one they took ashore (and which would be awkward to use at sea) might be two feet in diameter, making it more accurate and easier to read. One of the most pressing problems of navigation during Captain James Cook’s time was the inability to accurately calculate longitude. For many years, sailors could find their latitude with the use of celestial navigation. An instrument called a quadrant was used to sight a particular star or the sun, and then the angle between the horizon, the star, and the navigator was measured. Latitude could then be calculated from this measurement. However, longitude was another problem altogether; to be able to calculate longitude, one needed to know exactly what date and time it was to complete the celestial calculation. In 1714, the Longitude Act was passed in Britain. There were monetary prizes of 20,000 pounds for a method to determine longitude to an accuracy of half a degree of a great circle, 15,000 pounds for a method accurate to within two-thirds of a degree, and 10,000 pounds for a method accurate to within one degree. One “degree” would be about 60 miles. There were two major schools of thought on the subject of longitude: those who believed that accurate star and lunar charts alone could lead navigators to an accurate measurement of longitude, and those who believed that an accurate timekeeping device would suffice for the same reason. Each had problems; the celestial option had the issues that on cloudy days celestial navigation was troublesome and that one had to be an able mathematician to perform the necessary calculations, and the timekeeper’s problem was that no clock yet created was nearly accurate enough to keep correct time over long periods, nor during varying levels of temperature and humidity. The main figures representing each side of this argument were Nevil Maskelyne on the side of celestial navigation, and John Harrison on the side of the clockmakers. One problem for Harrison was that Maskelyne had a very important position: he was Astronomer Royal. 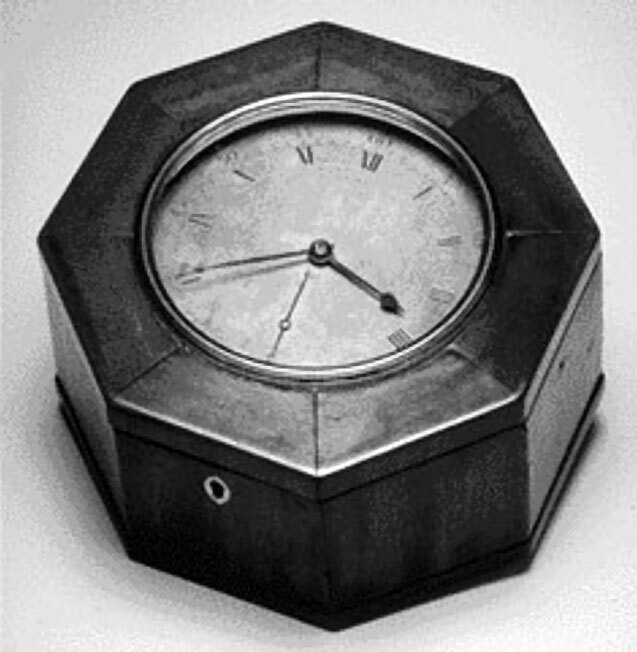 Captain Cook and his scientists carried out tests for the Board of Longitude, comparing the lunar distance method with chronometers modeled after Harrison’s designs. He took a chronometer named K-1 (Larcum Kendall’s first, and a close copy of H-4, Harrison’s fourth attempt), and three copies of it by a clockmaker named John Arnold. Cook’s log refers to K-1 on many occasions, calling it “our trusty friend the watch,” and noting “It would not be doing justice to Mr. Harrison and Mr. Kendall if I did not own that we have received very great assistance from this useful and valuable timepiece.” Cook believed so much in the use of the chronometer that he carried it on his third voyage as well. The lunar distance method, which an able navigator such as Cook could master, worked effectively, but only under clear skies. Cook preferred the chronometer, however, since Nevil Maskelyne was on the Board of Longitude, Harrison did not receive the full award until the king intervened for him. As Captain James Cook was conducting his voyages of exploration and discovery, Polynesian navigators had already successfully explored and settled the islands from New Zealand to Hawaii. 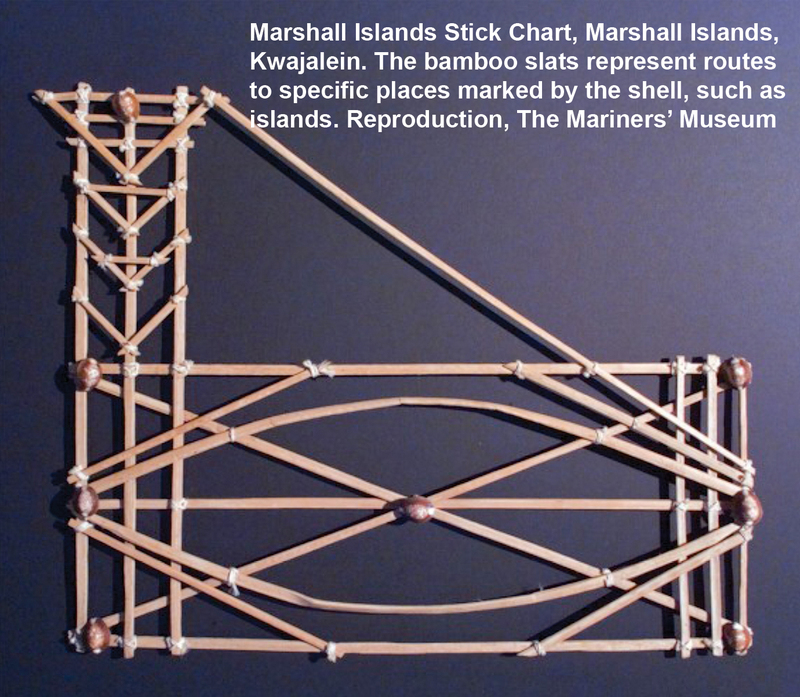 Remarkably, the Polynesians had developed a sophisticated and reliable means of wayfinding based not on science and mathematics, but rather on their innate knowledge of the seas and sky. By using the sun, stars, sea swell patterns, cloud formations, and seamarks such as bird flight habits, Polynesian navigators were able to steer their canoes over distances that amazed European navigators – including the two thousand miles between Tahiti and the Hawaiian Islands. 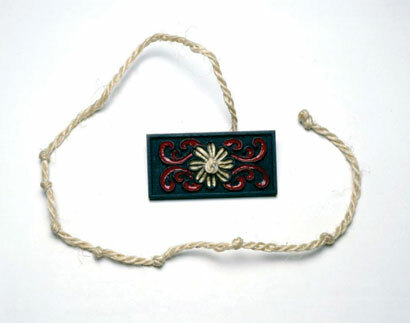 The Polynesian star compass was the key to finding direction at sea. The four cardinal points (north, south, east, and west) were located according to the rising and setting sun. During night voyaging, stars formed reference points. Polynesian navigators memorized the star compass as well as known islands whose locations corresponded to points of the compass. In training, a navigator would name an island as the center point, then go around the compass points naming the islands that lay in each direction. Beyond navigating by the sun and stars, the Polynesians used their extensive knowledge of the sea to successfully guide them through their voyages. By careful observation of sea swell patterns, wind direction, cloud formations, and patterns of bird flight and flotsam, traditional Pacific navigators pieced together the course they chose to follow. Sea Swells: Sea swells are waves that have moved beyond the wind or storms that generated them. Swells tend to be more regular and persistent in their flow than waves. 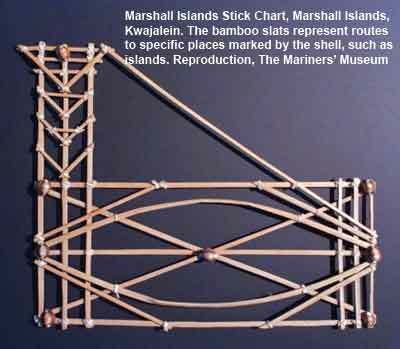 By observing the swells and understanding the winds that created them, Polynesian navigators could steer their canoes according to the swell patterns. Interestingly, swells are more easily felt than seen. Winds: Winds were also used to determine direction. However, wind changes could occur during the course of a day’s voyage. To better observe these changes, Polynesian navigators fixed lightweight wind pennants made of feathers and bark to the masts of their canoes. Cloud Formations: As clouds moved over sea and land, the Polynesians noted that clouds tend to be drawn to land in distinctive “V” formations. This cloud pattern is created by the reflection of heat radiated from the island. Many navigators also noted slight color changes in clouds over land, and were able to distinguish the landform from the color; a slight green indicated lagoon islands, bright clouds indicated sand, and dark clouds marked forested areas. Flight of birds: Flight patterns of specific species provided a reliable means of determining the direction of land. The fairy and noddy terns were especially important, as both species nest on land, and neither swims. Both terns fly to sea in the morning and return to land at dusk. By observing the habits of these birds, Polynesian navigators could not only determine the direction of land, but also its approximate distance. Fairy terns have a flight range of about one hundred twenty miles, while noddy terns have a range of about forty miles. Flotsam: Floating debris such as palm fronds, coconuts, and other vegetation also signaled nearby land. Experimental “wayfinding” has been traditionally performed in Micronesia, and is regaining credence as an art in Polynesia. 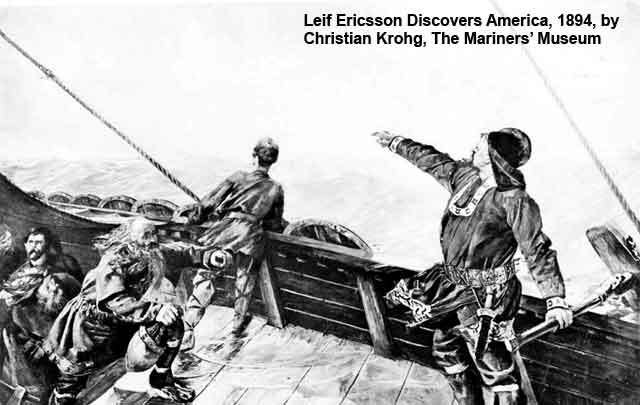 Viking navigation was handled by specially trained men who used the stars and sun to aid in their voyages. While birds were brought along on some voyages to be let go in order to follow them to the nearest land, they relied on navigation tools called peloruses, the sun stone, the bearing dial, the sun shadow board, and the sun compass. Primarily, the Vikings used the North Star or Polaris to help them navigate at night. Located in the night sky, directly over the north celestial pole, the distance from the North Star to the horizon was compared to the height of the star when they were at home. This measurement helped them to determine their latitude. The pelorus, similar to the ones used today, was an instrument much like a mariner’s compass, but without magnetic needles. It had two sight vanes and was mounted in such a way that the bearings of objects could be observed. The bearing dial or bearing circle was used to determine the latitude of the sun. It had a small platform with a vertical pin in the middle and a pointer, and it was used to track the position of the sun in the sky by marking the placement of shadows on the platform. The sun shadow board was used at noon to double check whether the ship was on the correct course or not. 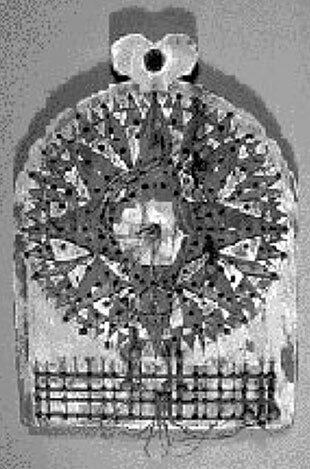 It was placed in a bowl of water to keep it level and the gnomen, the pin in the center of the board, marked the shadow of the noon sun. Circles marked on the board gave the sailors an area in which they could travel and still remain within their desired latitude. If the shadow of the noon sun extended beyond the circle, they knew they had traveled too far north. If the shadow was inside the line, they were too far south. 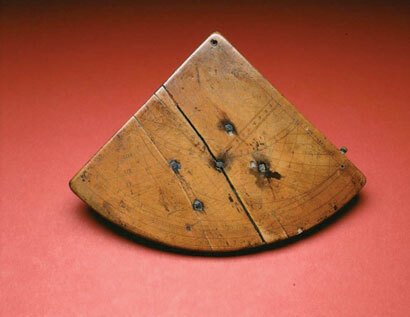 The sun shadow board’s midday measurement helped the Vikings make course corrections each noon, but was of no use to the sailors in cloudy or foggy weather. The sun stone was used on the days when fog or clouds obscured the sun. The stone, a mineral called Icelandic spar, would change color as it was turned in the light. A certain color would indicate the position of the sun through the fog or clouds but could only be used when there was at least a sliver of blue sky. The semi-wheel was a chart that recorded the year-round observations of the sun and measurements of its positions. The Vikings of Iceland collected this data, also noting where on the horizon the sun rose and set each day. This collection of information was used to determine their latitude as well as the cardinal directions, North, South, East and West. The sun compass recorded the different paths the sun took across the sky during the different seasons of the year. By drawing these different hyperbolas on the face of the sun compass, the Vikings had a record of the sun’s position for each time of year. They were able to determine, with great accuracy and at any time of day, their position at sea by rotating the disk of the sun compass until the shadow of the tip in the center of the compass fell on the hyperbola for that time of year. 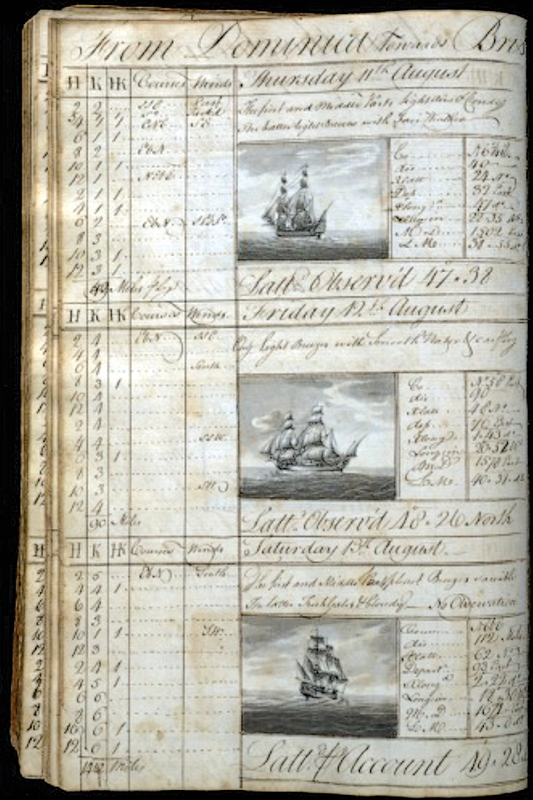 Logbook entries August 11-13, 1774, from the Logbook of the Snow Minerva, 1772-1776. The Library at The Mariners’ Museum. The term logbook comes from sailors recording their ship’s speed via chip log. In a blank book, captains would record their speed, wind and compass direction. As captains became more literate, the logbook became more detailed. Not only did they write the ship’s direction and speed every day, but they also recorded weather, any special events on the ship, cargo they took on or off-loaded, other ships they saw and even sea monsters. Whaling vessels recorded the type of whale caught and how many barrels of oil they got from it. If the captain carried his wife aboard ship, she, many times, recorded the log and in the back of the logbook there have been found recipes and poetry. Logbooks have become a very valuable tool for historians. One climatologist has looked through logbooks of a particular year to find a change in weather patterns. We can also retrace the steps of early explorers by using logbook entries. Scientists can tell how many and what kind of whales were alive during different time periods as well has how many of each species were killed. These images came from the logbook of Minerva, a merchant ship that sailed from Bristol, England to Cork, Ireland, the Madeira Islands, Dominica in the Caribbean, and back to Bristol. The voyage lasted from November 16, 1772 to February 11, 1776. Along the way, the Captain, Nicholas Pocock, recorded all the ship’s information as well as painted in the book. Each day he drew a picture of the ship, showing the weather. He water colored many of drawings and also drew pictures of ports at which they stopped. Pocock was born in Bristol, England, in 1740. His father was a seaman and Pocock went to sea at a young age. By 26, he was a captain. The merchant Richard Champion financed voyages to America where trade was very lucrative. While at sea, Pocock drew in his logbooks as well as in sketchbooks. After the American Revolution, Champion was unable to finance the voyages and Pocock turned to painting full time. He submitted a painting to the Royal Academy of Art in England, but it arrived too late. But Pocock had an exceptional skill and four of his paintings were accepted by the Academy in 1782. Pocock’s style was very detailed oriented; when he painted battle or sea scenes, everything was researched down to the last flag. Many of his paintings hang in maritime museums and art galleries. 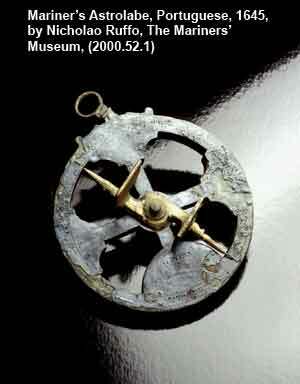 The main tool used by navigators and pilots on board a Chinese ship was the water compass, described above. For keeping time, incense, which was graded to burn a certain amount in a certain time, was used. As on later western vessels, a day was broken into watches. Unlike those western vessels, however, the day was broken into ten watches of 2.4 hours each. 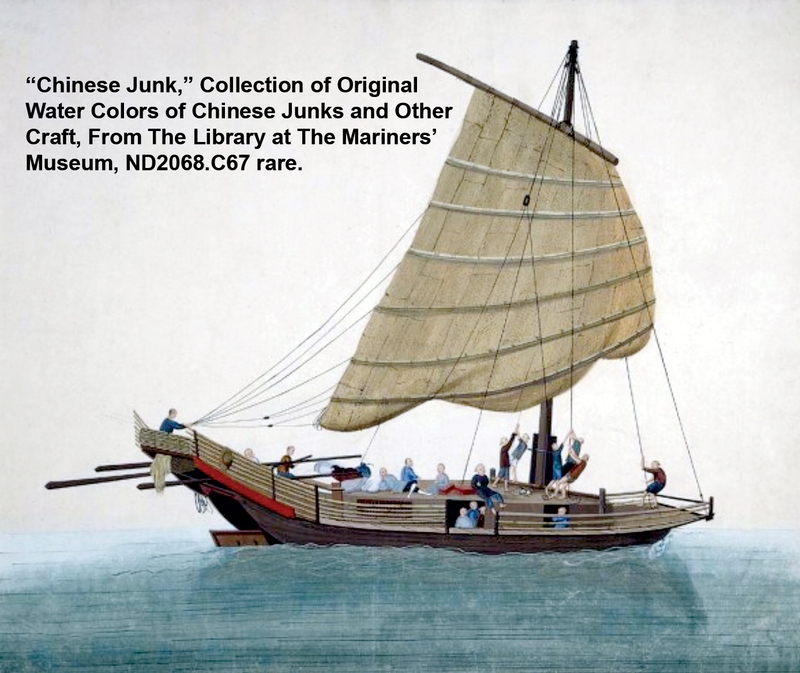 “Chinese Junk,” Collection of Original Water Colors of Chinese Junks and Other Craft, From The Library at The Mariners’ Museum, ND2068.C67 rare. 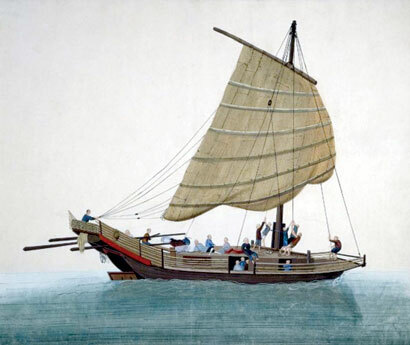 During the time of Zheng He and the Treasure Fleet, the average ship could travel about twenty miles per watch, at a speed of about eight knots. Speed was determined by throwing an object over the bow of the ship, walking the length of the ship while watching the object, and measuring, by chanting a rhyme, how long it took for the vessel to pass the object. Latitude was found using a similar theory, though slightly different method, than the European crossstaff. Navigators measured the altitude of Polaris or the Southern Cross above the horizon with an instrument called a qianxingban. The qianxingban was a board consisting of twelve pieces of square wood; the board would be aligned with the horizon, and navigators used the lengths of their arms to calculate the position of the stars. Another, simpler instrument used for this purpose was the liangtianchi, a vertical ruler. Captains also used sailing charts, which were much larger than their western counterparts. It was unrolled in sections, depending on where the ship was. The charts used by the Treasure Fleet were a series of sailing directions in the form of compass bearings and lengths of watches from port to port, across the Indian Ocean. It also showed any landmarks that might help the captains recognize their location. In addition to the sailing chart, star maps were available. To find depth and to determine what was on the bottom of the body of water traveled, pilots used a lead line. These were very similar to the lead lines used by western sailors. Europeans did most of their sea trading along coasts that were near them, and mostly in an east-west direction. If they were out of sight of land, it was usually not for more than a few days. There was no need, and therefore no interest, in measuring distances north and south. Kamàl, reproduction, 1977, by Nautica, Peter Ifland Collection, The Mariners’ Museum, (1998.39.7). The Arabs, however, traded along the dangerous shoals (shallow waters) and strong currents off the coast of East Africa which ran from north to south, and as far off as India, out of sight of land most of the time. It was important for them to know how far north or south they traveled along an unseen coast before it was safe to turn toward that coast and make their landfall. The device they developed was called the Ka-Mal, which means “guide” in Arabic. Though very simple and “low-tech,” it was used by the Arabs of East Africa and the Red Sea as recently as the 20th century. We don’t know when it was developed, but sometime after 900 CE, a time we know the Arabs had the Astrolabe. It also seems the Arabs developed the Ka-Mal from a similar Chinese invention. The Ka-Mal in its simplest form was a piece of wood; the navigator sighted the horizon at the bottom of the wood and Polaris at the top. When everything lined up, the ship was at the right Latitude to turn toward the city of their arrival. There would be a different piece of wood for each port. In time, the multiple pieces of wood were replaced by a single piece with a hole in the middle through which a string was fixed. A knot in the string, placed between the navigator’s teeth, would then set up the correct proportion of distance from the eye, and an alignment of the horizon and Polaris. Each knot in the string represented the latitude of a port they wished to make, but they did not use that term or use a latitude-longitude system. Vasco da Gama, the Portuguese explorer, was introduced to the Ka- Mal when he visited India in 1498. This concept was taken up by the Europeans in the 1500s and led to their developing the Cross-Staff. There were many devices in different parts of the world before 1200 which pointed north. Some were lodestones (magnetic rock) suspended by a string, others were lodestones floating on a piece of wood, some were magnetized needles (magnetized by the lodestone) which floated on a straw and pointed north, or were magnetized needles which were suspended by a string. However, the first people to make a practical compass, that is, a magnetized needle supporting a compass card showing four or eight points of direction, seemed to be the Venetians in 1274. It was likely a valuable trade secret, so they didn’t tell anyone. But after the year 1311, pictures showing maritime subjects all have a compass featured in them. Before that year, there are no pictures. The Chinese had used a lodestone for thousands of years, but it doesn’t seem to be used for finding direction at sea. Those who did use a lodestone or magnetized needle did not have a compass card attached to it. Loadstone, ca. 1600-1799. The loadstone in a silver case would be hung from a lead bar and it would orient itself towards North. The Mariners’ Museum. Before the modern compass came into use, land based traders, sailors and ordinary people had various ways of referring to direction when asked where they came from or where going to. They might say they were going towards a large mountain, or the sea, or the rising sun. Some of the earliest directions we have are from the Phoenicians, a sea-going trading people who lived in what we now call Lebanon on the eastern side of the Mediterranean Sea. They were important and powerful business people from about 1200 BCE to about 200 BCE. These mariners, when they were at home in the eastern part of the Mediterranean were asked where they went to trade their cargoes. Wanting to be somewhat accurate, they replied they were going toward the setting sun. In their language, it looked like the word, Ereb. Similarly, when they were in the western Mediterranean and were asked where they came from, the most logical answer was, The land of the rising sun, Asu. In time, other people heard these words and turned them into Europe, which is to the west of Phoenician cities, and into Asia, the land to the east of Phoenicia. The Phoenician peoples, especially those who had settled in the North African city they named Carthage, were eventually defeated by the Romans for control of trade in the Mediterranean. It was now the turn of the Romans to name directions in Latin instead of the Phoenician language. Even though the Romans were noted for their writing of great stories, plays, histories and biographies, when it came to naming directions, they didn’t do much better than the Phoenicians…it just sounded better in Latin. They called the land on the eastern Mediterranean the land of the rising sun, and in Latin that gives us the Orient. The land of the setting sun gave us the Occident; both names are common in English for the Eastern and Western Hemispheres of the earth. Today, we refer to China, Japan and other countries in the eastern part of Asia as the Orient. The Romans also gave us two other navigational tools related to direction and position finding. They named a grid system for their maps to measure distances east and west, north and south. Because the Mediterranean is a relatively long sea, east to west, but not very wide, north to south, they named the east-west direction the long direction and the north to south direction the wide direction. This doesn’t sound too exciting or adventuresome in English, but in Latin it comes out pretty nicely: Longitude measures east-west, Latitude measures north-south…the Latin equivalent for the English words for long and wide. Yes, our word long comes directly from the Latin. The discussion now comes to how these are put together in developing the compass and naming the directions we use today. +: Levante East (note, the symbol is a “cross”. See text. Notice these directions are the eight major points of a compass going clockwise around from North. In time, the Mediterranean sailors had these divided into 32 points of their compass to provide even more details as to direction. Until the 1700’s though, the 32 points were detailed enough, so they stopped. They did not divide it into 360 degrees until the 1800’s. When they did, they decided to also keep the point system at the same time, and determined that each of the 32 points was equal to 11 1/4 degrees under the new system. So if you changed your course at sea by four points, you were changing it by 45 degrees. But the 32 points did remind sailors of a certain flower, so the directions on the compass card were called the compass rose…they looked like the petals of a rose. When the first compasses come in to use in the Mediterranean, the directions were named for the wind direction. In time, this changed under the influence of Northern European sailors into the North, South, East, West directions we are familiar with today. There is one hold-over. When the French were making compasses in the 1300’s, they used a very fancy letter “T” to mark the North Wind…Tramontana. It looked like the lily flower, in French, Fleur de Lis. To this day, the fancy design often marking the direction of North on a compass, the Fleur de Lis, is the reminder of this older time when directions were named for the winds. The Northern Europeans developed their own names for directions, but they didn’t seem to do much better than the Phoenicians or Romans. They named the direction of sunrise from the Greek word for dawn, eos. In time, this becomes east. At noon, the direction toward the sun would be the sunne direction. This becomes south as people change their pronunciation of the word. In Europe, at least, the sun is always south of you at noon. The Latin word for evening is vespers, a word we still use for evening prayer services in certain Christian churches. In Latin, the first v is pronounced like a w, so it would sound like wespers. It’s easy to see how that becomes west over time. Finally, to the Scandinavians who are developing these directions, the land to the north of them was a place of cold, storms and terrible weather. In their time, hell was not a hot place, but one of freezing cold. So they called north the hell direction. They used the Greek word, nerteros. This changes to nord and eventually our word north. The directions on a modern compass are combinations of these four points of the compass. There are many interesting ways of remembering these directions: the word NEWS or the more colorful phrase, “Never Eat Squishy Worms”. Below is a diagram. You’ll notice the points half way between two other major points take their name. For example, halfway between North and East is North East. Half Way between North and North East is North North East. If you wanted to sound sailorly, you would pronounce this, “Nor, Nor Eas”. Nowadays, we hardly think about determining how fast we are going. Cars, planes, boats, even bicycles, can have an easy to read, and instantly read, speedometer to answer that question. For the mariners of the 1400’s, speed was determined by an eyeball guess made by looking over the side to see how fast the water flowed by. As distances traveled increased and as the need to record those distances became important to explorers (so they could accurately tell others how to return to the lands discovered), speed measurement also became more important. At first, as used by English sailors, speed was measured by what they called a Dutchman’s log, the mid-1500’s. This was simply tossing something over the side of the ship at the bow (it was important that the “something” floated) and measuring how long it took to reach the stern of their ship (Bow is the front, stern is the rear). The measuring was no more precise than counting the seconds out loud. Knowing the time it took and the length of your vessel, you could do the math to get speed. Another method was to mark two placed on the side of your vessel and note the time it took the floater to pass between them. (Speed x Time = Distance, the math is beyond the scope of this article, but see a math book or navigation book for the details of how it’s done). The next step seems to have been taken by the English in the mid-1500’s. They tossed a piece of wood over the side, but they did so off the stern and had a rope attached. The rope was on a spool which could easily turn. The rope spun off as the ship moved away from the wood sitting in the water. They then used a sandglass, 60 seconds, and measured the amount of rope which went over the stern. They then pulled the rope back in and measured how much had come off the spool. They thought that a nautical mile was 5000 feet. Therefore, the amount of rope which came off in 60 seconds could be mathematically compared to how much would come off if the rope were to spin-off for a full hour---their speed in miles per hour. You can imagine how much trouble it was measuring the rope as you brought it back. They did so by stretching their arms and guessing that the outstretched arm had six-feet of rope between the man’s hands. This figure of six-feet became known as a fathom because many English words were borrowed from Scandinavian countries, and fathmr means to measure. To make it less troublesome, the English decided to put a knot in the rope every seven fathoms, that’s 42 feet. They also shortened the measuring time to 30 seconds. This was done about 1570. The time to spin off 42 feet of rope is the same as taking an hour and spinning off 5000 feet…a mile. (If you do the math, you’ll find it’s actually 5040 feet, close enough for a sailor). Of course, if two knots passed through your hand, you were traveling two miles per hour. Three knots, three miles per hour. To this day, speed at sea is called knots and means one nautical mile per hour. Twelve Knots at sea means 12 nautical miles per hour. It’s incorrect to say , “12 knots per hour”; for you are really saying, “12 nautical miles per hour per hour”. By the 1400’s, a nautical mile meant a particular distance based on the earth’s diameter at the equator--one minute of arc was defined as a nautical mile. Since there are 60 minutes to the degree and 360 degrees in a circle, the earth’s circumference was divided by 21,600 minutes. In time, the measurement of the earth became more precise and scientists determined that a nautical mile was not 5000 feet, but exactly 1852 meters, or about 6, 076.116 feet. The quadrant received its name because it is one-fourth of a full circle. In fact, quad means “four.” It had much use even before it went to sea to help navigators. Astrologers would use the quadrant to help determine an eclipse of the sun or to forecast someone’s fate with help from the stars. It was simply a device for measuring the angular height of a star or the sun. Surveyors could use it to measure the height of a building or a mountain. It was even used to help aim a cannon to hit an enemy fortress. Quadrant, circa 1650, Peter Ifland Collection, The Mariners’ Museum, (1998.39.10). For the sailor, it was first used to measure the height of Polaris, the Pole star. While the earliest documented (written) use of the quadrant at sea is in the mid 1400s, it was in use well before that by astrologers and land-surveyors. It became important to Europeans when the Age of Exploration began in the early 1400s. Everyone knew that the pole star moved very little at night because it sits at the North Pole. They knew it wasn’t exactly at the North Pole, but pretty close. In fact it’s about one degree away from being exactly at the North Pole today, and was about 3 1/2 degrees off in the time of Christopher Columbus. People knew these things, but didn’t have any practical use for the information ashore. Sailors had learned from the Arabs that the Pole Star could also help with navigation; the height of Polaris above the horizon changed depending on a person’s Latitude, the distance above or below the equator. Knowing how high Polaris was at a particular port city you wanted to reach would help you navigate your way there. The Arabs traded along the east coast of Africa, north and south, and had to go offshore, out of sight of land, because of dangerous shoals (shallow water) and currents. They couldn’t see their port cities. So they sailed until Polaris was the right height, and then turned toward the shore to reach their destination. Until the “Age of Exploration,” Europeans traded close to well known coasts going north or south, or they traded along the east-west routes of the Mediterranean. They didn’t need to know latitude. Once they began to travel into unknown waters off West Africa, the need for the Pole Star and determining latitude became important. Of course, one of the problems with Polaris is that it disappears if you travel below the equator. The solution was to then navigate using the sun to determine latitude. The quadrant is simple to use. Sight the star, or sun, along one edge, the right edge in the diagram. The piece of rope hangs down because of the weight attached (called a plumb bob), and the scale crossed by the rope gives the angular height of the body. With that information, you can obtain your latitude. Of course, sighting a star is pretty easy on your eyes. But using the sun can be a problem because it’s so bright it may blind you. In fact, blindness and poor sight was a job hazard of early navigators. For more information, see the discussion of the Back-Staff. 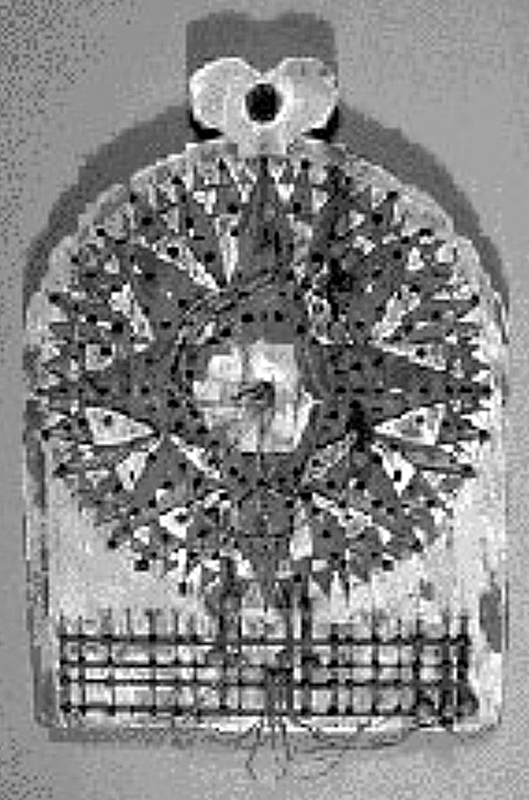 The Traverse Board is a wonderful instrument and one of the world’s first computers. You’ll notice no cord, no batteries, no error messages because there is no “booting.” It was a time when things were simpler, and things almost always worked. Of course, you couldn’t play any video games on it either. While we don’t know who or when it was developed, it has been documented in the mid-1500s, and it is likely it was developed in the early 1500s. Traverse Board, Reproduction, Donated by L. Eichner, 1957,The Mariners’ Museum (1957.19). “Watches” aboard ship, the work periods, were four hours long. They were broken up into half-hour segments because it was convenient to use a half-hour sandglass. At the end of each half-hour, a bell was rung. That was the time to record how fast you were going during the past half-hour as well as the direction you were steering. It was done on the Traverse Board. The Traverse Board has a diagram of a compass on it with all 32 points listed. The points are the directions the ship could be sailing. On each of these points there are eight holes drilled, from the center to the outside edge. You therefore have eight concentric circles covering all of the points of a compass. Each circle represents one half-hour segment of an eight-hour watch. In the center of the compass diagram there are eight pieces of line with a peg attached to each. After each half-hour, the ship’s boy would place one of the pegs in a hole representing the direction the ship had been sailing for the last half hour. He would do that for each half hour of the watch and thereby create a record at half-hour intervals of all the courses steered during the watch. At the bottom of the Traverse Board, there is a second “table.” There are four rows of holes on the left side and four rows on the right. Each row represents a half-hour of the watch and allows a sailor to record the ship’s speed. Each row corresponds to the concentric circles found around the compass. The first concentric circle on the compass is marked for the direction traveled at the end of the first half hour. The speed for that first half hour is marked on the first row in the lower table, the drilled holes in the row representing the ship’s speed in knots. The third hole would be three knots, the fifth hole, five knots, etc. There are eight pieces of rope with pegs attached at the bottom of the Traverse Board to keep track of the speed during each half-hour. At the end of the watch the navigator can tell the direction and speed at each half hour interval by looking at his “computer,” the Traverse Board. He then uses the board to come up with a composite, or single course and distance traveled for the four-hour watch period. It was easy to convert speed to distance for each half hour: four knots for half an hour is two nautical miles. Of course, if the wind doesn’t change at all during the four hours, neither the course nor the speed might change, but winds usually do change and that’s why there was the need to keep track of them. 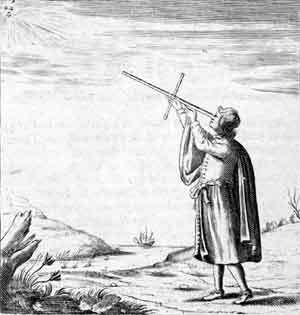 A major problem in using the Cross-Staff was in having to look at the sun. This led to blindness or at least damaged eyesight for navigators. To solve the problem, John Davis (sometimes spelled “Davies”) invented an instrument in 1594 (published description--1595) that used the shadow of the sun instead of the direct view of the sun to obtain the altitude. It also eliminated the need to look in two directions at the same time. Now a navigator could look at the horizon and line up the shadow of the sun with the horizon at the same point on the instrument. The observer adjusted the shadow vane, the upper, left scale in the diagram, so that the sun would cast its shadow on the horizon vane, the lower, left-hand object. Sighting from the back (right-hand side in the diagram), the observer would adjust the eyepiece at the back of the Back-Staff so that the horizon and sun’s shadow were aligned. He would then read the scale of the shadow vane, add it to the scale of the eyepiece and thereby obtain the altitude of the sun. As with other height-measuring methods, this number was used to obtain the latitude of the observer. Davis invented the instrument in 1594, but both he and others made a number of modifications of his original instrument. Of course, it could not be used to measure the altitude of Polaris. Why? No shadow. The Back-Staff was very popular and soon most mariners used it in place of the astrolabe or Cross-Staff. While it was more accurate than either of those instruments, it would be replaced in the mid-1700s by the Octant or Sextant, which would be even easier to use and more accurate. Back-Staff, 1711, by Walter Hensaw, Peter Ifland Collection, The Mariners’ Museum, (1998.39.151).